I love Frankenstein. DC has had a lot of fun with the character since Grant Morrison introduced him, and Frankenstein: Agent of S.H.A.D.E. was one of the few New 52 titles I really enjoyed. I have also really enjoyed the Rebirth reboot of Superman, and what they have been doing with the characters and the series. So putting Frankenstein into a tale with Superman was almost certain to excite me. 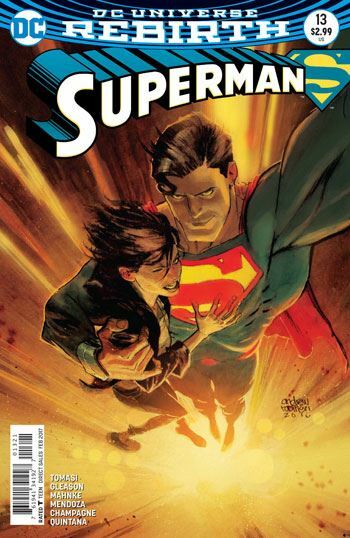 And while I did very much enjoy the first half of the story, in the previous issue, that got completely topped by this latest chapter, which puts Superman into the middle of the romantic squabbles between Frankenstein and the Bride. Oh sure, there is a monster they need to deal with, but the former lovers are wildly entertaining no matter what they are doing. Frankenstein’s unrequited love for his former flame and her bitter resentment over him killing their monstrous child ensure a powerful, and heat breaking, dynamic between the pair. 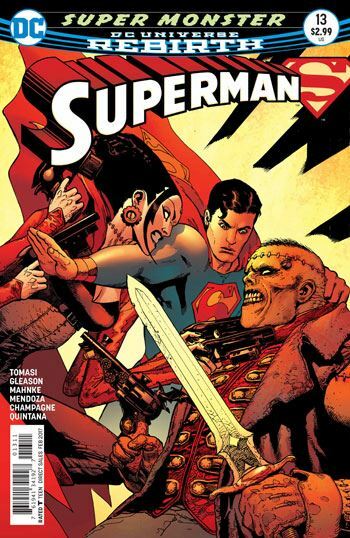 And while there is sufficient action against Kroog, the villain of the tale, the core of the story lies in contrasting the relationships of the Frankensteins with that of Superman and Lois. Doug Mahnke’s art is exceptionally good, and Peter Tomasi and Patrick Gleason deliver a really well written story, which fills readers in on the tortured past of the monsters. As always, any story that uses Frankenstein just leaves me wanting more.